Every entrant into the Canadian Football Hall of Fame has done something unique, but no one will enter the hall the way that Paul Brule will. “I go back in my mind through one of my jobs,” the former St. Francis Xavier star running back said. Brule enters the Hall as an amateur player, having racked up unprecedented yardage with the X-Men from 1964 to 1967. 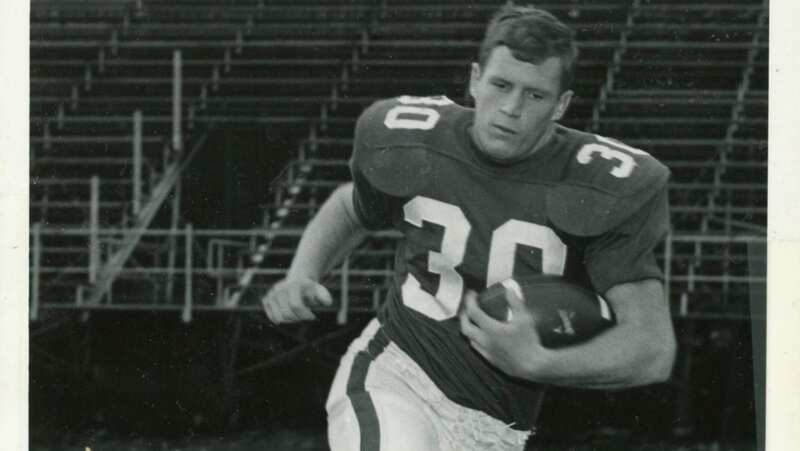 In 1966, Brule became the first player in Canadian university history to crack the 1,000-yard rushing mark in a season. He set a single-season record with 20 rushing TDs and would go on to break that in 1967 with a 25-touchdown season. He scored a USports record eight touchdowns (seven rushing, one punt return) in one game; a record that still stands today. He graduated after the 1967 season with 51 career touchdowns (49 rushing). Fifty-one years later that record stands across the country. The school won seven out of eight AUS banners between 1960 and 1967. “I was going to a university and a team that hadn’t lost a regular-season game in five years,” Brule said. In his first two years with the program he saw the field on special teams and played backup running back. He didn’t get the starting job until the player in front of him had graduated. The learning process began from the second he joined the team, though. He saw how the town of Antigonish, N.S. embraced the team and the type of environment Loney had built. “It was so professional, really. I say this to the dismay of some CFL people, but going from St. FX and the way we were treated, we were treated like pros,” he said. Brule established himself as a first-class talent and in 1968, his hometown Ottawa Rough Riders made him the second overall pick in the CFL draft, but ended up in Winnipeg that same year. Things changed for him when he got to the pro level. The fast, powerful athlete that ran through the opposition for a solid two years prior was moved to the other side of the ball. Brule successfully made the transition. Playing free safety, he was named a West Division all-star in 1970, pulling in nine interceptions. He also returned kicks and punts. He was with the Blue Bombers through the 1971 season and spent 1972 with Montreal before retiring. Sport has played an integral role in his post-football days. He went from the Alouettes to doing marketing for the Olympic Committee in Montreal, leading up to the 1976 Games in a role that let him travel the world. Jobs with companies like Bauer took him to more Olympics. Working with Jostens had him dealing with college programs and professional leagues across North America. Now, 46 years after he stepped away from football as a player, he’ll get the ring that he helped design, tying his personal achievements and his second professional life together. “It’s been a fun ride. No complaints,” he said.